Build wealth. Invest with success. Are huge corporate debts finally worrying stocks? Global stock markets resumed a downward slide in the past couple of days. In the US, with the Thanksgiving holiday just a couple of days away, the S&P 500 index was down 1.7% on Monday and another 1.6% on Tuesday. This was led by tech stocks. So far, 2018 continues to be the “year of the US dollar”. At the level of major investment asset classes, it’s about the only thing that’s gone up against everything else. Tech and growth stocks have boomed in recent years, in some cases reaching prices with eye-watering valuations. But the excessive optimism has moderated significantly in recent weeks. For example, Apple stock is down 22% from its early-October peak. Amazon stock is down 25% from its September peak. Both companies were (very) briefly valued at over $1 trillion. Perhaps that big headline number focused investor minds on whether they could really be worth that much? The NASDAQ 100 index is heavy on tech and other hype stocks. Two-thirds of the market capitalisation comes from the technology (43%) and communications services (22%) sectors. The latter sector was recently expanded to include stocks such as Alphabet (a.k.a. Google, 9% of the index) and Facebook (4%). On top of that, another 9% of the index comes from healthcare, which is heavy on biotech. And then there’s Amazon (10% – the bulk of the Consumer Discretionary sector’s 16% index weight). 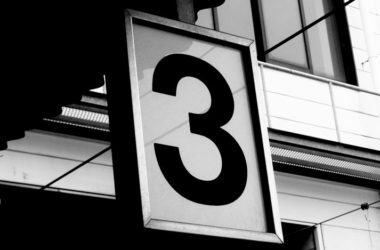 Putting them together – tech, comms, healthcare / biotech and Amazon – comes to 83% of the total NASDAQ 100. Overall, said index was down 3.3% on Monday and a further 2% in early trading on Tuesday. This was led by the big names: Apple, Microsoft, Alphabet (Google), Facebook, Amazon and Netflix. They fell an average 4.6% on Monday, and a further 3.6% in Tuesday’s pre-market trading (before the market officially opened). Stocks aren’t the only things falling. As I write, Brent Crude is down 4% today. It’s down a quarter from its early-October peak and marginally down year-to-date. Meanwhile, last year’s mega-bubble continues to be this year’s mega-bust. Cryptocurrencies continue to fall. Bitcoin, the big daddy of cryptos, is trading at $4,444, a price last seen in October last year. That’s 78% below its 17th December peak of $19,992. On the other hand, it started 2017 trading at $951, so is still up 4.7 times since then. But signs are that bitcoin and its crypto-brethren remain in a distinctly bear market. But let’s get back to stocks. Back in August, as the market edged towards its September peak, I showed that most of the S&P 500 wasn’t actually all that pricey (see here). Once you stripped out the tech sector and the big skew caused by Amazon stock’s huge multiples, I estimated the trailing price-to-earnings (P/E) ratio was just 14.4, instead of the headline 22.9 figure. That put it in line with the median P/E of 14.7 for US stocks since 1871. The market’s down about 7% since then, which implies the bulk of US stocks are actually reasonably priced at the moment (although, obviously enough, with a big range). So what’s weighing on investor sentiment? What’s new in October and November that wasn’t around in August or September? Not a lot is the answer. Periodic flare-ups in US trade policy have been going on all year. Increased US budget deficits are not news. Rising US interest rates have been expected for a long time. 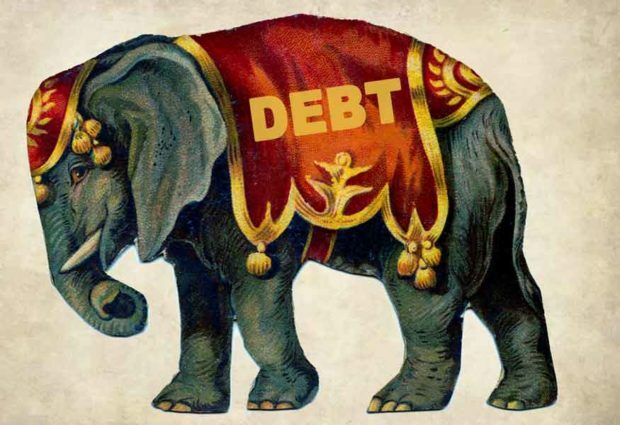 In recent years, the elephant in the room has been the rapid increase in corporate debt levels. But, as Nellie grew fat on the sofa, investors didn’t seem to mind. Nellie was buying trillions of dollars of common stock, via share repurchases (buybacks). 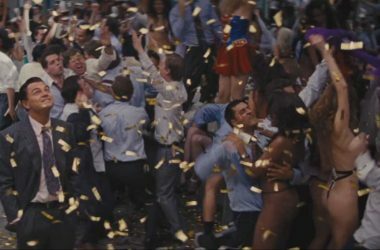 That was assumed to leave everyone else’s stock more valuable, in terms of its share of future earnings. This all seemed cool. Interest rates were ultra-low. 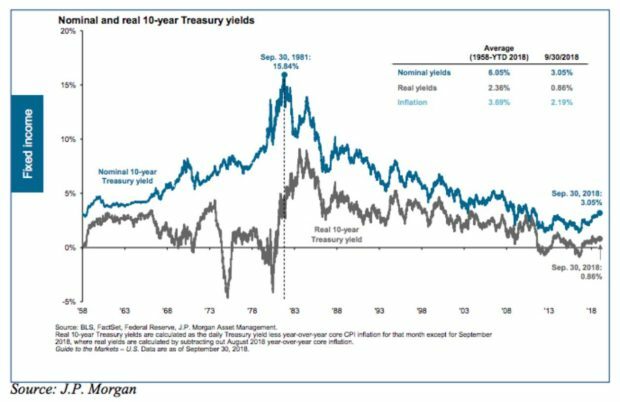 Yields on US treasury bonds – a reference point for corporate borrowing – reached an all-time low in 2016 (see the blue line in the following chart). Inevitably, along the way, US corporate debts started to pile up again. 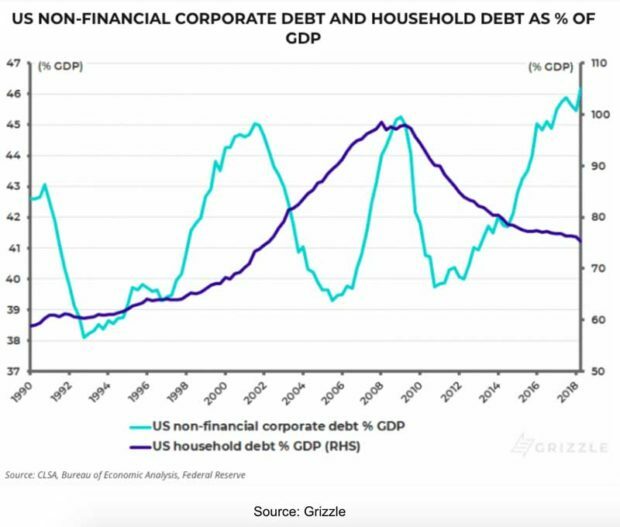 In fact, US non-financial corporate debt is now at a new record high in relation to GDP (whereas household debt is well below its 2008 peak). Not to worry, said the optimists. Companies are also sitting on big cash piles. 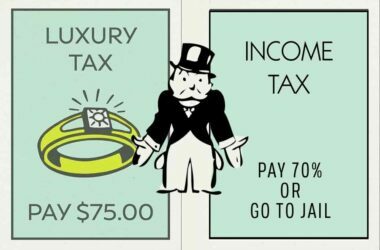 Before the recent US corporate tax reforms, international corporations were penalised for bringing overseas cash profits back into the US. So they’d pile up cash overseas and borrow at home (to pay for those buybacks, amongst other things). Except, the evidence doesn’t back this up. 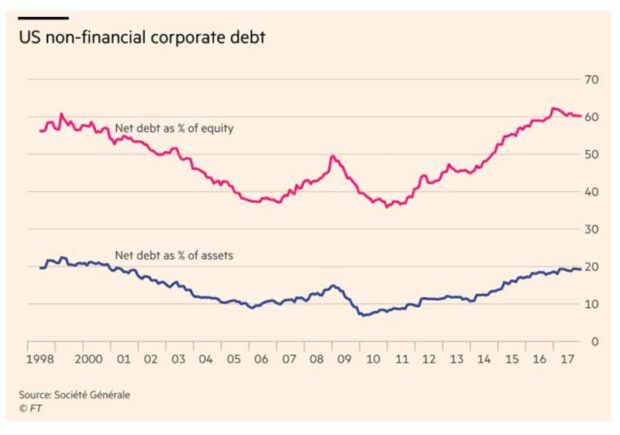 As a percentage of both assets and shareholders’ equity, US corporate net debts – being gross debts less cash – are back to the high levels last seen in year 2000. With corporate debts already at high levels, and rates continuing to rise, this presents two issues for stock investors. First, company managers may not want, or be able, to further increase their debt levels. That knocks out the biggest net buyer of stocks in recent years (see first chart). Second, new or refinanced debt will come with a higher interest cost than people have got used to, which will depress future profits. 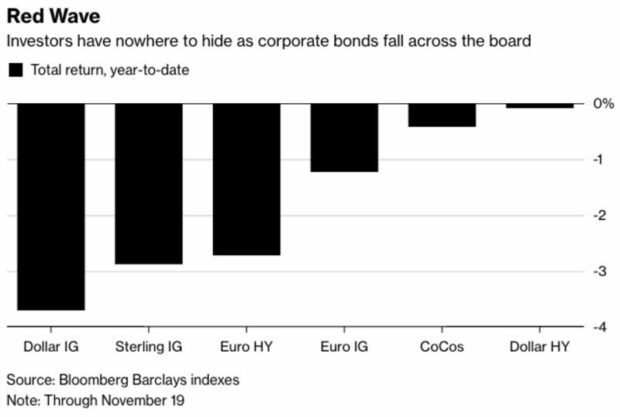 Incidentally, did I mention that investors in corporate bonds have also lost money this year? See the following chart: “IG” means investment grade and “HY” means “high yield” (which, before the investment industry re-branded it, used to be called “junk”). Is there any good news? A couple of things, really. One is that, as overall market moves weigh on most stock prices, there are more stocks of financially-sound companies that trade at highly attractive valuations. Whatever happens to market prices in the short-term, these will do well in the medium- to long-term (as fundamentals re-assert themselves). See here for access to my recommendations. Also, remember that US households have been cutting their debt levels, relative to GDP. 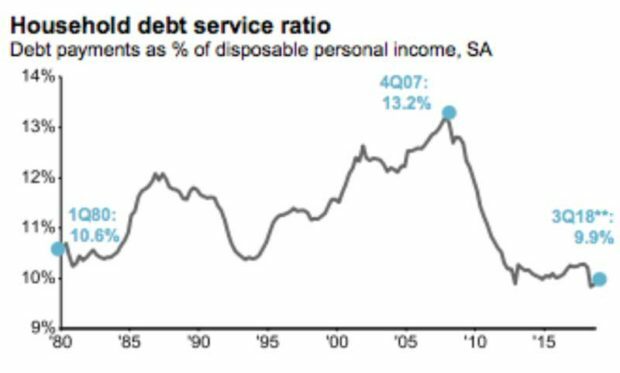 Rates are still low, and the combined effect is that household debt service costs are actually the lowest they’ve been in decades, as a percentage of disposable income. The following chart shows that they’re still lower than at any time since the start of the 1980s (barring a minor uptick this year). Of course, that household figure is an average that spans a huge range of individual circumstances. Undoubtedly, there will be recent college graduates with unpayable student loans, and people who still think credit cards are a convenient way to borrow money beyond the end of the month. But it’s good news nonetheless. A lot of US corporations (but by no means all) may be in poor financial shape to face climbing interest rates. But US consumers look to be in a reasonably strong position (especially if a lot of the interest relates to the uniquely long-dated fixed-rate mortgages available in the US). 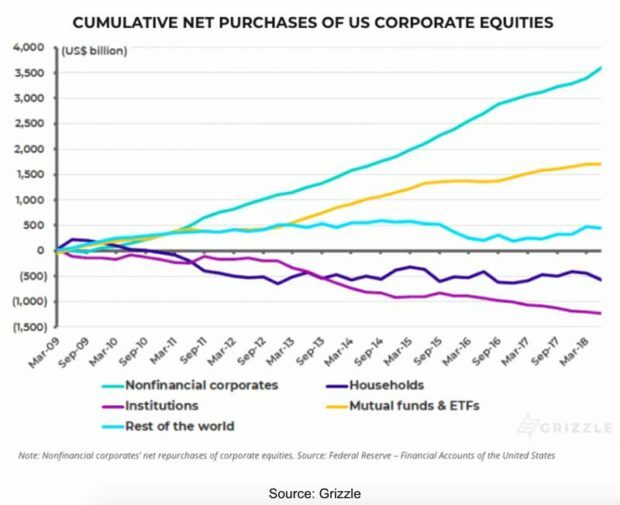 In the meantime, I can’t say for sure that the high level of US corporate debt is what’s got investors worried right now. But, if it’s not a factor, there’s clear evidence that it should be. Rob is the founder of OfWealth, a service that aims to explain to private investors, in simple terms, how to maximise their investment success in world markets. Before that he spent 15 years working for investment bank UBS, the world’s largest wealth manager and stock trader with headquarters in Switzerland. During that time he was based in London, Zurich and Hong Kong and worked in many countries, especially throughout Asia. After that he was Chief Investment Strategist for the Bonner & Partners Family Office for four years, a project set up by Agora founder Bill Bonner that focuses on successful inter-generational wealth transfer and long term investment. Rob has lived in Buenos Aires, Argentina for the past eight years, which is the perfect place to learn about financial crises. 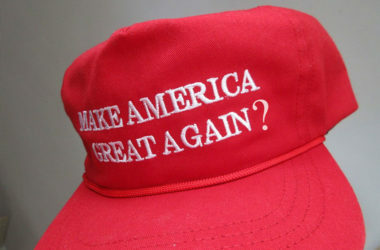 Has socialism reached the US? Is the US stock bubble as big as early 2000? Copyright © 2018 OfWealth, All rights reserved. No part of the reports produced by OfWealth may be reproduced by any means without the express written consent of the publisher. Consent will almost always be granted provided that OfWealth is given clear credit as the original source.The information contained herein is obtained from sources believed to be reliable. While carefully screened, the accuracy of this information cannot be guaranteed. Readers should carefully review investment prospectuses and company financial statements, when available, and should consult their investment advisor before investing.NOTE: OfWealth is strictly a financial publisher and does not provide personalized trading, investment or tax advice. No person mentioned here by our writers should be considered permitted to engage in rendering personalized investment, legal or other professional advice as an agent of OfWealth.Additionally, any individual services rendered to subscribers of OfWealth by those mentioned herein are considered completely separate from and outside the scope of the services offered by OfWealth. Therefore, if you decide to contact any one of our writers or partners, such contact, as well as any resulting relationship, is strictly between you and that service provider.OfWealth expressly prohibits its writers from having a financial interest in any individual securities they recommend to their readers, other than collective investments such as exchange traded funds. All employees and agents of OfWealth must wait 24 hours after an internet publication prior to following an initial recommendation on a security. SHF Publishing LLC, P.O. Box 590, Horsfords Business Centre, Long Point Road Charlestown, Nevis West Indies.